The rock's a little wet in places but in the daze of the early morning mist I'm up and over the tricky last little move and sighing with the whispers of wind and the shivering of the trees below me. What a delight to be in such a beautiful place with nature showing off all her sleeping beauty, it seems I am the only one alive tonight, this is all mine, I feel honoured. I skip my way towards the road, slipping, sliding, and giggling at my movement, like a dog on wheels! I reach Seathwaite and in the confusion of the night take the wrong route up to Sour Milk Ghyll. I thrash my way through the trees and undergrowth to find the stream, then the bridge, then the steep climb to the boggy marshes below Gillercombe Buttress. I have never been here before and after swimming my way to the boulders below the crag, I find myself lost in a sea of dark and featurless rock. I find the gully and the rest is a blur of dark, damp rock and a yearning for the top. Imagine a life of just hills, rock and you. It's just awesome! The sky is filled with sheets of gold, I don't even remember turning off my headtorch, maybe it just died along the way. 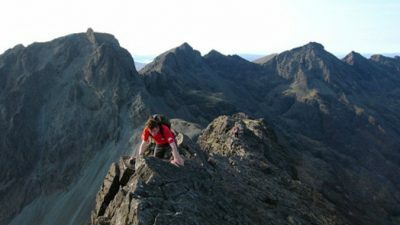 It's a long hike to Pillar and in the glow of the dawning sun I feel the flow as I move up and over the impressive rock on Rib and Slab climb. I decide to down - climb New West climb which proved a little tricky. I then decided, rather than return via Robinson's Cairn, which was difficult running terrain, I would climb back up New West and up to the summit of Pillar where running on the footpath to Black Sail Pass would be quicker and easier. As I had never climbed at Pillar before and not done much research, I didn't know about the little abseil descent into Jordan Gap. What an unpleasant surprise to find myself down- climbing again, but all this soon passed, as I basked in the early morning warmth on the summit slopes of Pillar. Napes Needle. The only acquaintance I've had in the past was during the Winter of 2002, when two mates; Woody and Bazza, I decided to do Wasdale Crack in wellie boots and brollies! The heavens had opened with a mixture of sleet and hail. The outing proved to be challenging, but only did we smile and laugh at our adventure when in the comfort of the Wasdale Inn, sipping on hot chocolate and thawing our limbs, busy winding up Bazza over his hypothermic and erratic behaviour which saw him spit the dummy big style. Woody and I were treated as human skittles with rocks as bowling balls from the feet of Bazza as we ducked and dived our way down the scree towards the haven of warmth and sanity again. 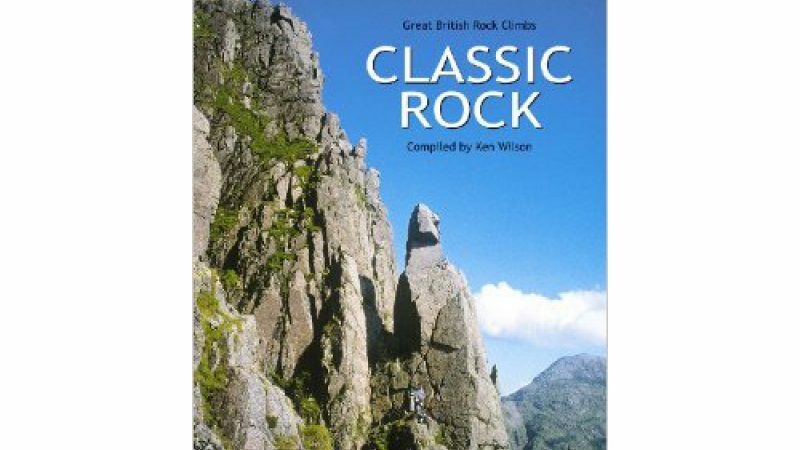 But today the rock is dry and as I squeeze my sodden feet into my climbing shoes, the past memories fill me with warmth and confidence. Down climbing proves to be a battle of squirming and panting, a little cramp in my groin, so I neck a bag of salty crisps, reckon the salt will sort it. Needle Ridge up and down then around to Trophet Wall. Never climbed it before, just awesome. Nearly take some air from some sudden gusts, compose, up again, a little exposed, yee haa!! Just fantastic. Scafell is dark, cold and scary. I'm totally gripped. Jones's Route and Moss Ghyll Grooves are a hazy recollection of fear and fascination. On one hand I am filling my pants whilst on the other, I am excited about what will happen next, will the hold be wet, will I have the balls to pull it off! I'm pulling over the final moves of Jones's Route on wet holds, big jugs, but big jugs feel like smeary crimps when the mind is racing around an ampitheatre of hundereds of feet of nothingness. I reverse the move, and do the mandatory self -belief talk, what am I doing here? Would be nice to be some place else right now. Back on the holds, no point faffing about now, get on with it, reach for the next one, go on now, doesn't look so good though, go on, too late now, commited, feet are slipping, nope, got it, keep going, struth! Happy days again as I hop skip and jump my way up Scafell Pike to join the masses on the summit, the time is 12.30 p.m, been on the go for over nine hours now, but feel the worst is behind me, Bowfell will be a breeze! Nice to have some company with two fell runners out for the day too. Wall to wall sunshine, breezy and perfect visibility as I climb over Esk Pike and again to Bowfell. I decide down - climbing the route will save some time, but find out it takes a few more years off me! Green rock, cold, and polished. Amazing climbing, but not such positive conditions, still I get to chat to some other climbers too, they seem to think I'm a little bonkers! Bowfell will be a breeze, hmmmm! Gimmer soaks up the afternoon rays as I down - climb C Route and Ash Tree slabs to the yells of frustration of a nearby climber belaying his girl who just can't retrieve that cam. Please be patient, it's such a beautiful day, there's no rush, my mind is in a haven of warm strokes and natural motion, slow motion. Everything is so slow, lazy, languid eyes, I pause on Bracket and Slab to chat to a young lady, she is so cheery and pleasant, this day is full of nice things. I move on in my mushy state of being, floating over the moves and soon gliding down the steep slopes towards Stool End Farm. Don't think my sole's going too hold out! Yip, it's falling off. Need a drink, quite hungry now, some Jelly Babies, yum, yum, yum! That's better, left trainer doesn't look so good. Big climb up to Red Tarn, head down, more Jelly Babies, feel sick now, looks like it's getting dark, did I just see lightening? Is that a black panther? Strange, could have sworn I was just talking to someone. Trainer's going to fall off, not far now. Over Great Carrs as the sun dips it's head into the distant ocean, still the day goes on. It's 6.30 p.m, been on the go for over fifteen hours, but I'm drifting with ease, the world is still, I'm flying in a sea of hills and lakes as I swoop down into the Jaws of Goats Water and stumble in the dark up to my final route. 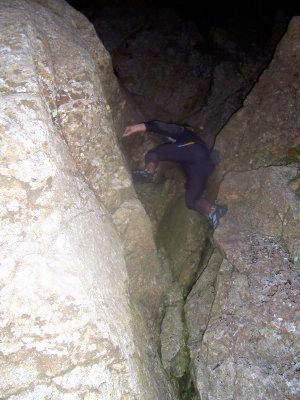 With my flailing beam I clamber up Murray's Route on Dow Crag. The air is wild with whisps of Autumnal change. 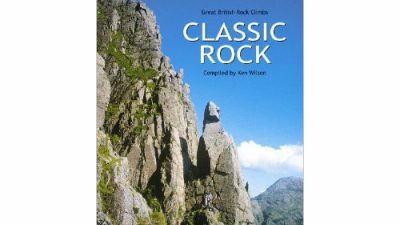 The rock is cool and dry, my head is numb and relaxed, my movement, assertive and fearless. A little worrying not being worried! Stop the clock! 19.17 p.m. I sit down and stop. I marvel in the twinkling sky and a relieved glance from the moon. What a truly beautiful day, I could not have wished for more. Nature allowed me play in the hills whilst it showed off all the delights of the Lakeland landscape. I urge any climber interested to follow this enchainment during a glorious spell of weather, it's just awesome! Total height rock climbed 3000 ft.